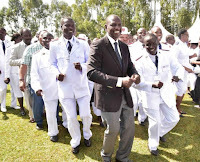 Monday April 15, 2019-Deputy President William Ruto on Sunday responded to COTU Secretary General Francis Atwoli’s remarks that he would not be on the ballot come 2022. Speaking to a congregation at the Salvation Army Citadel in Kakamega County, Ruto dismissed Atwoli's prediction, saying he will and must be on the ballot come 2022. He accused the vocal long-serving trade unionist of using witchcraft to tell the future. "When you hear someone saying that he has been told by witch-doctors that a certain person will be on the ballot and the other will not...it tells you a lot about where the country is right now," Ruto stated. The DP added that he would pray for the COTU boss to seek the Kingdom of God.